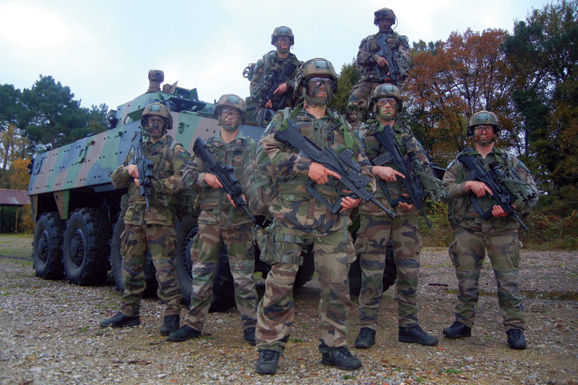 A combat group of French marines of the 2nd RIMA fully equipped with FELIN. The combat group is supported by a VBCI infantry armored combat vehicle. VBCI brings new combat capabilities: mobility, intensive fire with its 25 mm gun, tactical situation awareness, observation and surveillance, by day and by night. The connection with the dismounted combat group is ensured by a new generation radio network part of the FELIN system. Photo: © Ph Wodka-Gallien. The 2nd Marine Infantry Regiment is one of the French Army units that has fought the most battles under its flag. Attached to the 9th Marine Infantry Brigade, it has been equipped with FELIN since September 2012 and new VBCIs (Armoured Infantry Combat Vehicle) since June 2014. The mission of its 980 “Porpoises” includes the French marine infantry’s dual function, overseas and external operations. In January 2013, equipped with FELIN, the 2nd RIMA was sent to Mali for the Serval operation. A year later, it joined the Sangaris operation in Central Africa. The French dismounted soldier is now inseparable from FELIN (Fantassin à Equipements et Liaisons Intégrés, or Integrated System for the dismounted soldier). An electronic and optronic revolution from our daily lives in support of military action. Long-range day/night aiming sight, multifunction infrared binoculars, GPS, new generation personal radios and portable computers for command and coordination are combined in the integrated and modular system. Each soldier has an encrypted personal radio and a tactical terminal that displays his unit members’ positions. This personal radio is equipped with a relay function. To date, 17 regiments are equipped with FELIN, or nearly the entire French infantry. FELIN was conceived to increase a soldier’s know-how in terms of shooting precision, day/night fighting capabilities, intelligence and command. Emphasis was also put on protection, for the individual soldier and for the entire section. Employing the latest optronic and digital technologies, the observation and shooting functions have been optimised for urban fighting. The round-the-corner sighting function makes it possible to observe an objective and neutralise it, without exposing the foot soldier to enemy fire. FELIN has been used in a broad range of real situations: high intensity combat, patrols, convoy escorts, securing zones and even protecting civil populations. FELIN’s modular architecture lets a soldier choose the configuration based on the mission. This principle is at the heart of the French army infantry units’ successful engagements. A Milan anti-tank night armoured vehicle of the protection company of a French marines regiment. 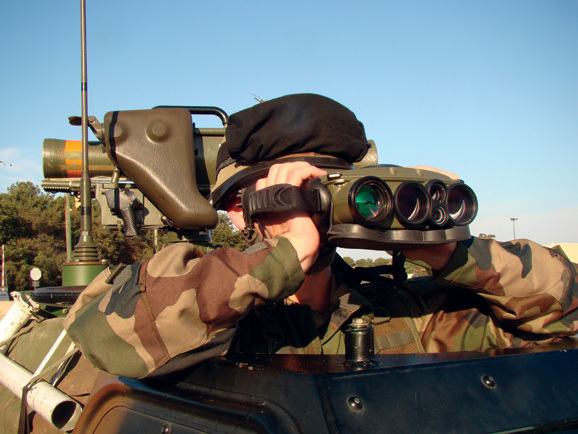 Developed and produced by Sagem, JIM LR multifunction binoculars are widely used by a large number of units: reconnaissance, special forces, forward observers, combat infantry squads, border protection units, anti-tanks vehicles. Photo: © Ph Wodka-Gallien. For long-range detection, the section head is equipped with the JIM LR (Long Range). The 2nd RIMA underline the ability this equipment gives them to observe over several kilometres. The JIM LR has an infrared sensor, a colour day channel, a rangefinder, a GPS and a magnetic compass. It can also record video and images. With JIM, a dismounted soldier can now precisely identify and locate an objective, to inform or guide the artillery. Easy to use, the JIM LR equips armoured vehicles in the Milan anti-tank sections and the scout and support sections. French engineers have managed to integrate all of its functions in a single piece of equipment that weighs less than 3 kilograms. Produced and developed by Sagem, the JIM LR has won over the armies of more than 30 countries, including Canada, Denmark, the United States, Italy, the United Kingdom and Switzerland. More than 7,000 units are in service or on order. The JIM LR also equips specialised intelligence regiments, like the 2nd Hussar Regiment of the French Army, a unit of the Intelligence Brigade. Two marines of the 2nd Infantry Marines Regiment (RIMA) of the French Army during a drill. The 2nd RIMA used FELIN system in Africa for Serval operation in Mali and during Sangaris in Central Africa Republic. The night aiming sights (Sword) are clearly visible on their FAMAS assault rifles. Photo: © Ph Wodka-Gallien. In September 2012, the regiment received its FELIN equipment. “Permanent adaptation is in the culture of marine troops. It was in this spirit that the regiment appropriated FELIN. This turning point took place under excellent conditions” congratulated Colonel Pascal Georgin, commander of the 2nd RIMA. The “marine infantry” culture brings an additional characteristic, that of amphibious action. With that in mind, the 2nd RIMA conducts two amphibious exercises every year, most recently Catamaran in October 2014. Having completed the tactical appropriation of FELIN, the 4th company of the regiment embarked on the BPC Mistral for Corsican Lion, a manoeuvre held in October 2012 off the coast of Solenzara, in Corsica. A combined exercise, Corsican Lion involved the British Royal Marines, putting into effect the defence agreements signed between Paris and London at Lancaster House in November 2010. On this occasion the 2nd RIMA showed that its new equipment satisfies the requirements of amphibious action. Commanded by tactical headquarters, its marines conducted a night manoeuvre alongside the British section, while the land advance was done on VAB armoured personnel carriers. The 2nd RIMA is a seasoned regiment. It is at the leading edge of the Serval operation in Mali, an offensive launched in January 2013 on the order of the President of the Republic under the terms of resolution 2085 of the UN Security Council. It joined the 21st RIMA in Bamako. 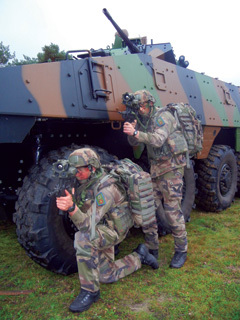 The onboard part of the combat is performed in the armoured vehicle, in the case of the 2nd RIMA on the VBCI, the French Army’s new Armoured Infantry Combat Vehicles. Before the disembarked phase of the combat, the manoeuvre is prepared using the command’s portable computer. Based on this tactical tablet, the section’s first lieutenant prepares the outing for his groups. Connected to the dismounted soldiers’ radio network, this computer integrates digitised mapping, messaging functions and displays images sent from the infrared binoculars and aiming sight. In the field, this tablet uses GPS to locate combatants and vehicles. Today FELIN equips all types of infantry units: grenadiers-light infantryman, parachutists, mountain infantry and motorised troops. Sagem, a subsidiary of the Safran Group, is a French manufacturer and the prime contractor for the system as part of a programme assigned to it by the French Ministry of Defence. At the cutting edge of digitisation, the French Army is therefore equipped with the world’s most modern and most powerful integrated soldier system, a “combat proven” system.